Desh Travels (Total 15 Buses) Now you can enjoy Wi-Fi while you travel through bus. 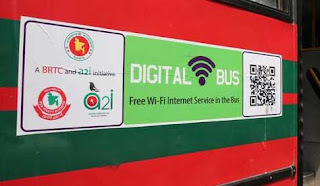 Mobile network company Teletalk Bangladesh Limited and Robi Axiata Limited introduced Wi-Fi facility for the following buses in several routs including city buses and inter district buses. Teletalk Bangladesh Limited primarily launched Wi-Fi facility to 10 BRTC buses that runs in Dhaka city from Uttara to Motijheel. Smartphone users can ejnoy internet through this Wi-Fi during the journey. And Robi Axiata Limited introduces Wi-Fi for following buses in Dhaka city. Dhaka University bus for Dhaka University students and staffs. Total 30 buses. They also introduces inter-district buses which are Wi-Fi enabled. How to recognize BRCT Wi-Fi Bus: You can see this type of sign or sticker with writing “Digital Bus- Free Wi-Fi internet service in the Bus”. These buses are Wi-Fi enables. How to use/activate Wi-Fi in BRTC Bus: Beside the door of the bus where you will see this sticker, there is a QR code. To use Wi-Fi, you have to scan this QR code with your smart phone. So, to scan this QR code in order to use Wi-Fi, you have to have a QR code scanner app in your phone. There are many QR code scanner in Google play store or Apple store. You can install any of them.